No, this is not an essay about the iconic dessert for the upcoming family holiday (which is unfortunately, but unquestionably based upon a brutal, genocidal piece of ‘American’ history.) After all, the website where this blog finds it’s home, is named Eating Art Work, with the subtitle: A Food Life Story conversation. So it is logical to talk about food, or at least use food as an image or metaphor, right? Actually, I was wondering which sort of pie you pictured when I wrote about pie charts a few days ago: dessert pie or pizza pie? I grew up in northern New Jersey (and as previously stated: ‘you can take the girl out of Jersey, but you cannot take the Jersey out of the girl’ – and that is so true, but why? Tangent.) In my hometown, pizza was definitively called pizza pie. In fact my parents would talk about ‘getting a pie for supper’, never mentioning the word pizza. Now I have spent my adult life here in New England, where ‘pie’ refers to a rolled crust with sweet, preferably fruit based filling. Be that as it may… before I get totally lost in that lovely digression about food pies, savory and sweet, let me return to the pie chart, which is, of course, merely a circle, drawn on paper and divided geometrically into sections. In my post entitled Alone, I was reflecting on the desire (need) for more private time. The pie slices which I discussed were arbitrarily defined and so I’ve been thinking about what I said, what I want my life to look like and how, in fact, things are currently configured. In a delicious bite of irony, the ostensible topic of my NaBloPoMo posts, Friendship (or Relationships) has been the area of my life that has taken the greatest ‘hit’ in the past 21 days. Writing daily blog posts takes a chunk of time out of my days and that has to come from somewhere, right? Don’t get me wrong, I am enjoying the writing exercise, but as a ‘former English teacher’ (like being a Jersey girl, you never stop being an English teacher) I’m unable to just type and post. Grammar, flow, word choice, logic, structure and certainly correcting typographical errors are all essential parts of the process and that takes time. The other day I realized that I am essentially writing an ‘in-class essay’ everyday. Honestly, I don’t know if this is precisely true, but there is a common-sense logic to the advice. First of all, stressing and obsessing does not help any situation, especially where children are involved. They pick up on the stress and things inevitably get messier, not better. Secondly, it makes sense to learn to trust the body, our own and our child’s, to express it’s needs and find balance. We are certainly subject to influences that teach us to ignore signals from our body. Letting children make choices about what they eat and when, empowers them and encourages them to practice ‘listening’ to their bodies. Point being? I can practice trusting that things will balance out for me in terms of time spent on work (this writing) and time spent catching up with friends. And, that berating myself for being a ‘lousy friend’ is certainly not going to help me in any way. 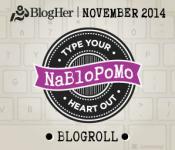 This entry was posted in All food, Friendship, Writing and tagged NaBloPoMo 2014 by Assembling a Cooking Life. Bookmark the permalink.